It was the sort of party you would be reluctant to turn up to, and its cancellation would have caused a sigh of relief. But when the US president replicates the feigned hurt of a guest who has been impugned, the puzzlement deepens. 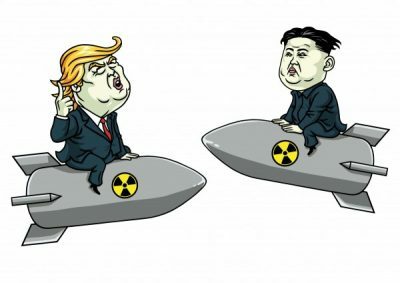 A mix of crankiness and promise, Trump’s letter announcing the cancellation of the Singapore meeting with North Korea’s Kim Jong Un was another etching on what is becoming an increasingly scrawled tablet of unpredictable manoeuvres. More importantly, it shows a sense that Kim is ahead of the game, cunning beyond capture, difficult to box. It is instructive to see how blame was attributed in this latest act of diplomatic befuddlement. Everything is, of course, saddled on the North Korean leader. But the feeling that Trump has somehow been left out is unmistakable. Whether it is the babble of the usual chicken hawks or not is hard to say, any peace treaty and durable arrangement on the Korean peninsula will and can never be attributed to the pioneering efforts of the North Korean regime. Should they win this, the US will be left out to dry by yet another inscrutable power, outwitted and, even worse, seduced. The letter shows traditional Trumpist dysfunction, a mix of fulmination, regret and tempered promise. Predictably, the issue of this abrupt act is not considered his doing, but that of his counterpart. He wants to be ascendant, and to that end, demands a degree of self-accepted inferiority on the part of his opponent. That Kim spoke about the DPRK’s nuclear capability was taken as a slight, suggesting that Little Rocket Man was getting a bit ahead of himself. The disparity of positions there is evident: the US nuclear stockpile is neutralised by its sheer enormity. To have such weapons on such a scale suggests redundancy rather than value. North Korea, in contrast, need only possess a few murderous weapons for political insurance. Such a position remains traditionally constipated, one keen to keep up the squeeze in an effort to extract reliable concessions. It also ignores the dogma of US policy towards the DPRK, refusing to accede to the regime’s desire to obtain a non-aggression guarantee and, to that end, seek ultimate denuclearisation only if and when its own security can be assured. The Economist could still admit, despite the prospect of a “bad deal”, or “narrow agreement to protect America” made in exchange for retaining nuclear weapons, “the summit still seemed like a gamble worth taking. A day before the cancellation letter was issued, Pyongyang invited a gaggle of international journalists to Punggye-ri Nuclear Test Site to note the destruction of tunnels and buildings at the facility. Instead of seeing this as a gesture to allay mistrust and build confidence for negotiations with Seoul and Washington, fears abound that this is nothing more than an act of wilful destruction of valuable evidence and site sanitisation. Giving the appropriate signals and touching the right buttons, the statement seemed to capture Trump expertly: speak to ego and laud current and future effort. The statement had its wanted effect, stirring the president like a well planted caress and tickle. All this goes to show that Kim has had a good run thus far, dragging Trump to near historic proportions in seeking dialogue. The US president has been shown up out witted, and, even with egg on his face, he can only offer a hope that his opponent might change course.